Shopee, is dropping prices to as low as ₱20 for some amazing products on the online shopping platform on today’s Shopee 4.4 Summer Bazaar. Committed to giving its users the best online experience, Shopee is offering more items at huge discounts up to 99% today across different categories. Here are six amazing deals to watch out for at the Shopee 4.4 Summer Bazaar. Watch your favorite TV shows in high definition with the Avision 24″ LED TV. With a size of 24 inches, it will be easy to find a spot for this HD-ready TV in your house and start watching. You can also play your home movies on the Avision 24” LED TV as it comes with USB support for music, movies, and photos. Ever wanted to watch concerts in your home with excellent sound quality? Do just that with the A&S Soundbar 100. A&S is known for designing and manufacturing high quality and value for money consumer electronic products. Its Soundbar 100 comes with a smooth wireless connectivity featuring Bluetooth V4.2 streaming. Karaoke fans can have their next sing-along party for only ₱20 when they buy the Wow! Fiesta Melody at the Shopee 4.4. Summer Bazaar. It comes with thousands of built-in songs and a USB drive that functions as a multimedia player. Switch between video night and movie night effortlessly. Really get into the groove of what you’re listening to with the Bavin Unique Earphone High Power Music with Built-in Mic. Its 10 mm. HD HiFi speakers and 3D speakers gives users an immersive deep bass experience. Control everything you want to hear with just a few clicks of the remote. Lovers of wireless headsets should take advantage of this sale and get the Promate Tango-BT Foldable On-Ear Wireless Stereo Headset. It is powered by a 250mAh battery that allows for 10 hours of use via Bluetooth. It features high-quality protein leather cushion padded cups for passive noise-cancellation. This Bluetooth speaker with an LED Alarm Clock Display is a steal because at only ₱20 you not only get a Bluetooth speaker and FM radio, but also a clock with alarm features. Every room should have one. 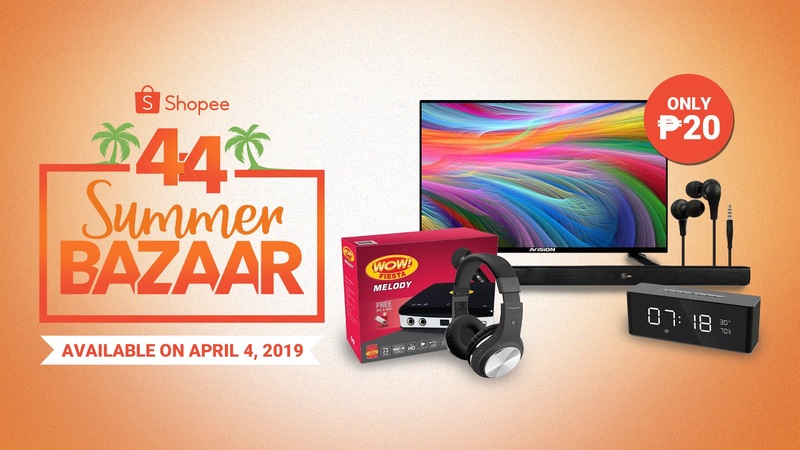 Shop these items and more exciting deals on the Shopee 4.4 Summer Bazaar now! For more information about Shopee 4.4 Summer Bazaar, visit http://shopee.ph/4-4. Download the Shopee app for free via the App Store or Google Play.